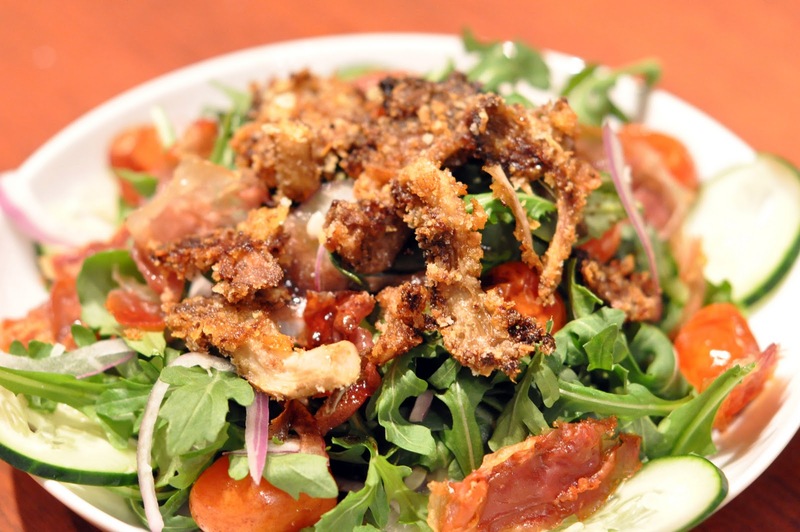 Everyone should have an amazing salad in their repertoire. For you single bachelors, they say the way to a girl's heart is through the stomach so the way to a health conscious girl's heart is with a salad. When I went to Terroni's last year, the one thing that blew me away was the mushroom salad. Longing to have it again, I took a few stabs at trying to re create it. I added a few extra items to make the salad more colourful and to add enough extra things so it could replace a meal. Mix together 1/2 lemon juice, extra virgin olive oil and balsamic vinegar (I do 3 parts to 1) in a bowl. Set aside some as a dressing for the salad and the rest will be used for the tomatoes and mushrooms. Mix together balsamic vinegar and olive oil. Lay the tomatoes on a baking sheet and drizzle the balsamic vinegar / olive oil mixture. Bake for 20 mins at 425 F (You can make little slits in the tomatoes so they don't explode). I find baking the tomatoes gives a much more pleasant texture and enhances the flavour. Crush the bread crumbs into fine pieces and mix with the parmesan cheese. Slice the oyster mushrooms into equal pieces (as best you can). Dip the mushroom pieces in the balsamic / olive oil mixture and the coat with the cheese/bread mixture. Then place on a baking sheet. Broil for about 8 mins or until mushrooms reach the desired texture. Place the prosciutto on a baking sheet and bake at 400 until the prosciutto gets crispy. I use the cheaper Canadian / American prosciutto because I am baking it, I'll get the good stuff for my sandwiches. Slice the red onion and cucumbers very thin and mix with the baby arugula. Toss with the salad dressing in a bowl. Plate with the mushrooms and prosciutto. DONE! It is a great recipe! However, I didn't put red onoins. I tryed it for lunch and I am absolutelly love it!